The Wardroom staff at HMS Vernon, the Officers Stewards and Cooks and general domestic staff. Click on photo to open large image in new window. 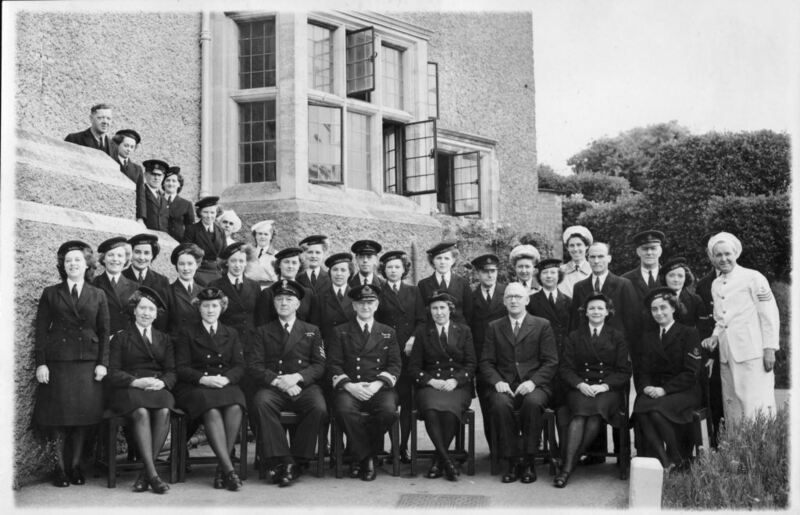 A group of nine Wren Officer's Stewards at HMS Vernon pose for their photo; Lois is in the back row far right. Click on photo to open large image in new window. Lois ( far right) with three of her fellow Wren Stewards (O) at HMS Vernon. Click on photo to open large image in new window. 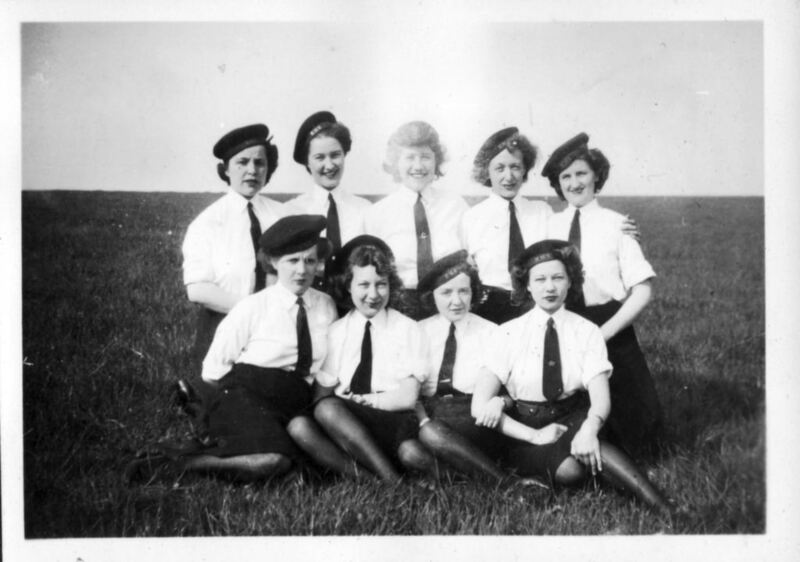 Like hundreds of young single women in war torn Britain 20 year old Lois Price volunteered for the Women’s Royal Naval Service (WRNS) and was enrolled as an ‘immobile’ Wren Steward (O), WRNS service number 21082, on November 10th 1941. She was to serve as an Officer’s Steward assigned to the wardroom at HMS Vernon at Roedean, Brighton where she reported for duty on November 23rd. Regular, ‘mobile’ Wrens, could be assigned to any station worldwide, but ‘Immobile’ Wrens were restricted to duties in stations near to their homes so that they could remain living at home and then travel daily to their places of duty. Lois made the daily journey to work from her family home in Mayo Road, Brighton to Roedean by bicycle; her route took her through several areas which had received the attention of enemy bombers and strafing attacks. 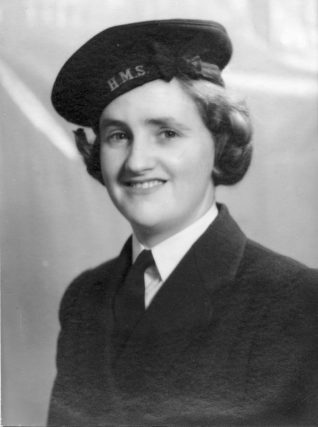 At the time she began her naval career the threat of invasion along the south coast was high and official advice given to Wrens if the enemy landed, was that they were to get out of uniform as soon as possible to avoid capture. 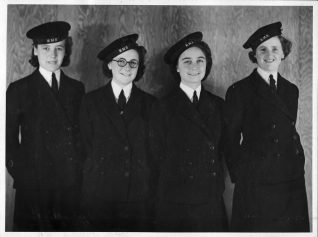 As an Officer’s Steward Lois would have been assigned several officers for whom she would be responsible for carrying out domestic duties such as making their beds, pressing their suits if requested, and generally keeping their cabins tidy. Additionally she would have served in the wardroom and would have been on duty for five and a half days a week with occasional duty on Sundays. On December 20th 1943 Lois was promoted to Leading Wren and assumed a supervisory role over the duties of several other Wrens when on duty. HMS Vernon ceased operations at Roedean in the June of 1945 a naval contingent remained in residence to de-navalise the various sites prior to it being returned to its owners, Lois was to be a part of this reduced complement until her release date came through. On 15 August 1945, the day the nation celebrated VJ Day, Lois was married to Rifleman Christopher Lade of the Royal Sussex Regiment, a local man from Terminus Road, Brighton; they were married at St Martin’s church, Lewes Road, Brighton. The service was conducted by Father James Morrell, a childhood friend of the groom, who later became the seventh Bishop of Lewes. Lois left Roedean for the final time on September 6th 1945 to start her 56 days of dispersal leave before being officially discharged on November 2nd 1945. The notation on her certificate of employment reads “A capable and reliable steward. Keen and conscientious and a good leader.” Her certificate of service is marked “Suitable for re-entry” should she have wished to remain in the WRNS. More images from Lois’ time in the WRNS at Roedean can be found on the Royal Navy Research Archive Web site.